No prizes for guessing the dominant theme among football books due to appear on the shelves in 2016, when the state of English football comes under the spotlight not only because of the European championships due to take place in France in the summer but because half a century has now passed since the most glorious of all the nation's summers, when England won the World Cup. A rash of titles marks the 50th anniversary, some a celebration, others a lament, given that the national team has won nothing since. Definitely leaning towards the latter category, Henry Winter’s Fifty Years of Hurt , an analysis illuminated by interviews with some of the biggest names in English football, is due to be published by Transworld under the Bantam imprint in June. Winter, who recently moved from the Daily Telegraph to The Times and is generally seen as the English media's foremost football commentator, describes Fifty Years of Hurt as "a journey into a national obsession." Winter's book will be jostling for shelf space with a host of other World Cup titles, the first of which appears later this month when Pitch Publishing releases 66: the World Cup in Real Time , by Ian Passingham. This book is a fascinating attempt to take the reader back in time 50 years to relive the 1966 finals and the build-up as if they were happening today, telling the story in newspaper-style reports, not only revisiting the matches themselves but what was happening off the field too. There are some familiar themes, with tales of players breaking curfews, football's first-ever drug-testing programme, the England WAGS of the day and FIFA coming under fire. All are skilfully put together by Sun journalist Passingham, who draws on his 30 years' experience in newspapers to give the reports a real authenticity. Look out also for The Boys of '66 - The Unseen Story Behind England's World Cup Glory , due to be published by Penguin in April. Written by John Rowlinson, the book takes a story of which everyone knows the ending back to its beginning and the long road followed by manager Alf Ramsey to build the team that walked out on to the Wembley turf on that historic July afternoon. In just over three years Ramsey selected no fewer than 50 players before arriving at his final XI. This book charts the chequered path to eventual victory, assesses both the players who made the final squad and those who lost out. Rowlinson is a former journalist and television executive who enjoyed a long career with BBC TV Sport, where he was responsible for World Cup, Wimbledon and Olympic coverage among other events, and later became Director of Television at the All England Club, before joining the Organising Committee for the Olympic and Paralympic Games as Head of Broadcast for London 2012. 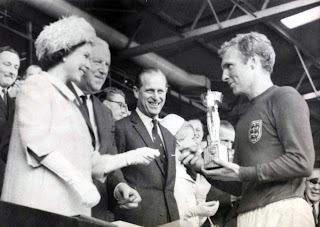 Geoff Hurst's hat-trick stole the headlines on the day of the final itself and, as captain, Hurst's West Ham teammate Bobby Moore became a football icon the moment he received the Jules Rimet Trophy from Her Majesty the Queen. Yet the player who did more than any to win the World Cup for England was undoubtedly the brilliant Bobby Charlton, the attacking midfielder from Manchester United, who shares his own personal memories of the tournament and everything that surrounded it in 1966: My World Cup Story , to be published in in June by Yellow Jersey. Still with the World Cup anniversary as the point of reference, in Four Lions , to be published in May by Head of Zeus, the cultural historian Colin Schindler explores the changing landscape of postwar England through the careers of four iconic England football captains: Billy Wright, Bobby Moore, Gary Lineker and David Beckham. Schindler argues that in England, more than any other nation, the man with the captain's armband has symbolic significance in that he embodies the nation beyond just football. The four lions he has selected embody half a century of change: Wright smoked a pipe and had a side parting; Moore, the hero of '66, exuded the cool of his era but never found a role beyond football; the savvy, telegenic Lineker hung up his boots to become the face of BBC football; while in the tattooed body of Beckham can be read the impact of commercialisation, corporate sponsorship and the cult of celebrity. Also in May, financial journalist and football fan Peter Chapman looks back to the World Cup year in a broader socio-economic and cultural context in Out of Time: 1966 and the End of Old-Fashioned Britain (Wisden Sports Writing). Chapman, whose previous books include The Goalkeeper's History of Britain as well as a history of the Lehman Brothers, grew up in north London and was 18 in 1966. He paints a vivid and beautifully written picture of how life was in Britain in the 60s and the impact that summer had on British society. Look out too for 1966 and Not All That (Repeater Books), a collection of new writing and newspaper reporting from the tournament, both in the English and foreign press, that aims to bring new perspective to the 1966 World Cup and the evolution of the game in the last 50 years. And Steve Mingle, who has written a number of books on Manchester City, takes a different angle in When England Ruled the World: 1966-1970 (Pitch Publishing), out in June, which looks at the impact of England's success on football at club and international level in the years that followed. Away from the 1966 theme, April sees the publication by Simon and Schuster of Mister: The Men Who Gave The World The Game , in which the popular Times football writer Rory Smith examines how the countries that became the dominant powers in world football in many cases owe their success to the pioneering work of English football coaches inspired by the growing popularity of the game in the late 19th and early 20th centuries to travel abroad, men who became known not as 'coach' or 'boss' but 'the mister' as they spread the gospel of football to far flung countries around the globe. Also in April, Trinity Mirror Sports Media publishes former Southampton manager Lawrie McMenemy’s long-overdue autobiography , plus Two Tribes: Liverpool, Everton and a City on the Brink (Bantam), in which Times writer Tony Evans goes back to 1985-86, in which the combined achievements of Liverpool and Everton brought back pride to a city shamed by the Heysel Stadium disaster. Later in the year, look out for Ring of Fire (Bantam), the latest instalment of Simon Hughes’ decade-by-decade retelling of the Liverpool story through the eyes of the players. After Red Machine revisited the 1980s and Men in White Suits recalled the teams and players of the 1990s, Ring of Fire, due out in August, takes the story forward into the 21st century. Other autumn highlights include Angels With Dirty Faces (Orion), Jonathan Wilson’s history of the Argentina national team, and The Wenger Revolution: Twenty Years of Arsenal (Bloomsbury), in which Amy Lawrence, author of Invincible: Inside Arsenal’s Unbeaten 2003-04 Season, combines with club photographer Stuart MacFarlane and manager Arsene Wenger to produce a sumptuous record of Arsenal’s last two decades. Books featured on The Sports Bookshelf are also available from Waterstones and WHSmith.